It’s not obvious, even to farmers, not in America. It wasn’t obvious to me till I had my first one several years ago at Michael Symon’s Lola, fried crispy on the outside, gelatinous and chewy on the inside, their richness offset by the sweet-sour heat of pickled chillis. Michael said he’d had a similar reaction when he’d first had one from Mario Batali. Where did Mario first have them? How we all now benefit from Mario’s adolescent weekends! For they are indeed a revelation. There’s simply nothing else like them. The flavor is porky and rich, of course, but it’s the combination of two layers of skin, which fries up very crispy, on either side of the soft chewy cartilage, that makes the pig ear such a unique treat. Once you’ve cooked them, they’re very versatile. Fergus Henderson, in his book The Whole Beast, features them fried crispy in a chicory and sorrel salad. He also cooks them in pea soup, then chills and fries them and uses them as a garnish in the soup—brilliant idea. Jennifer McLagan, in her new book Odd Bits, also uses them in a salad, but cold and sliced thin. She also suggests grilling them, something I’ve never done but intend to! For the above, I simply grabbed a handful of parsley from the garden, tossed them with some sliced shallot that I macerated in lemon juice, and garnished with some sliced pickled red chilis. Pig ears are best found directly from the farmer. I got them from a butcher once but they were badly abused. Look for fresh clean smooth ears. If they still have bristles, singe them off or shave them with a razor. It’s best to salt them a day ahead. Give them a healthy dose of kosher salt, add any aromatics you wish (thyme, garlic, black pepper, coriander, even something like clove or chinese five-spice would have good effects, especially when confiting them). If you’re going to cook them in water or stock, I’d blanch them first so they don’t release any gray proteinous stuff into your cooking liquid, rinse them, and cover them with stock or water. Add plenty of carrots and onions and bay leaves and pepper. Bring to a simmer, then put the pot in a low oven, below 200˚ F., for 8 to 12 hours, or until you can easily pinch thumb and finger through them and feel no resistance. Allow them to cool completely in the liquid. If you’re confiting them, which is best in my opinion—most flavorful, and also allows you to store them for months in the fridge—cover them with olive oil or melted lard, bring them to a simmer, then put the pot in a low oven, below 200˚ F., for 8 to 12 hours, or until you can easily easily pinch thumb and finger through them and feel no resistance. There are a few ways to finish them. You could cut them up and add them to any soup or stew, or slice and serve cold as McLagan does, but I think a pig ear needs to be crispy. It’s even fun to say. 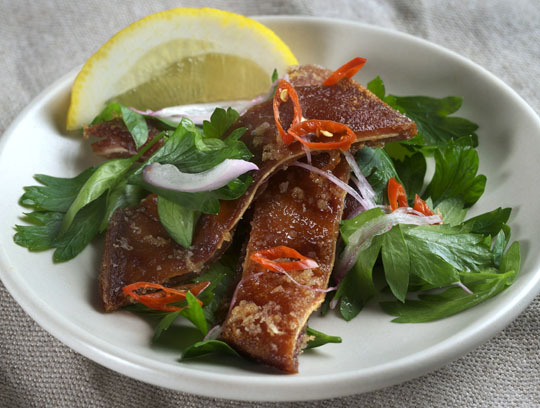 Say it aloud: “Crispy pig ear.” This is best and easiest to achieve in hot fat. I deep fry them whole, then slice them immediately to let the steam out; if not released in what is in effect a pocket (or purse even! ), the steam can uncrisp the skin. You can slice them before frying them, but they are seriously sticky buggers and you can have unpleasant clumping issues. A serious issue with frying is that water remaining in the skin can cause them to pop and splatter in hot fat. The above ears were cooked long enough that most of the water was gone and they didn’t spit, but I put a lid on the pot ajar to allow steam to escape; you could also use a splatter guard but a pot lid is best. You can also roast them, which avoids the splatter issue. Put them between pieces of parchment, and weigh them down with a second sheet pan, slide them into a 425 to 450˚ oven and cook until they’re crispy, 15 minuts or so. Then slice. I’m definitely going to try grilling them next. My post and video on pig skin/chicharrones. Pig’s ear pastries otherwise known as oreilles de cochon are fried dough with pecans and syrup. Eating Nose to Tail is a blog written by Sidney Oland who is not afraid of cooking various parts of any beast. Them Apples blog shares the recipe for Momofuku’s pig’s head torchon. Killing me, this looks so good. My butcher always has a big pile of ears and trotters by the front door, it’s time to start making use of them. The first pig’s ear I’ve ever had was at The Spotted Pig, served with a thick lemon caper dressing and some wild-looking greens. Ever since I’ve been a loyal pig’s ear consumer. Don’t fear the pig’s ear! Euclid Hall in Denver serves breaded and fried pig ear strips with buffalo dipping sauce. There are also a few Vietnamese restaurants around town that put pig ears (cold) in salad with other exotic similarly textured meats (snails, jellyfish, chicken feet). I’ve only cooked them once at home – they were rolled into a porchetta di testa. Since they were in the middle of the roll, the cartilage still had a little crunch. I just read about these in Michael Symon’s cookbook that you co wrote, now if I can find some ears. I will admit I was waiting for that “purse” comment. This salad looks delicious – thank you for the tutorial. No matter how long I cook pig’s ears they always explode in the fat when I deep fry them. That’s why I like to cook them on the grill to crisp them up. What I love about Paris is that I can buy them already cooked simply poached or poached then finished on the rotisserie. The burnt edges are the best. Are we going to cause a run on pig’s ears Michael? I’ve never had them but between your description and Donna’s photo, I’m sitting here wiping drool off my keyboard. WANT. I love pig’s ears. Also love the other end of the beast. Tails braised in sauerkraut and onions. MMMMMMMMMm. what a great article! your entries are always super educational. Thanks! I had good results pressure cooking the ears first (thanks to Ideas in Food for the suggestion), then drying them in a 200 degree oven for 30 minutes before frying. Much less splatter. And the resulting stock from the pressure cooker was concentrated porky goodness. I thought it was only Dave at the rootertothetooter.com who dared. Bravo! I wish I had two cents for every pig’s ear I threw in the rendering barrel. And I know I lost a lot more money on them than that, because it takes a lot of work in the de-hairing process to make them acceptable. The only customer I had that wanted them was a nice little Chinese lady. When I asked her what she did with them she just said “Slice and fry.” But even with suckling pigs I could never get past the chewy cartilage. Someday, maybe, I’ll give them a proper try. I need to try them fried for sure! The plate looks so scrumptious. I have only had them stewed with black eyed peas.